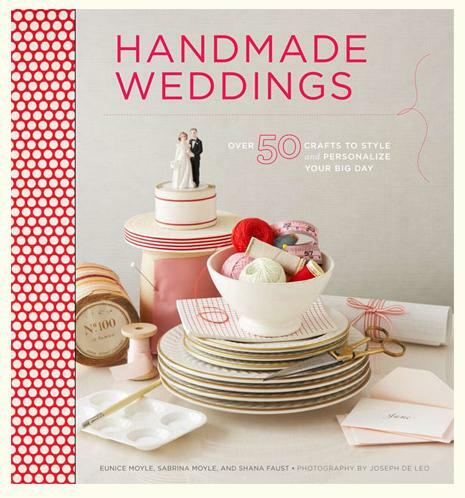 Recently Chronicle Books sent me a gorgeous book called Handmade Weddings: More Than 50 Crafts to Style and Personalize Your Big Day. Oh how I wish I had this book 8 years ago when I got hitched. The book is written by Eunice & Sabrina Moyle the talented sisters behind Handmade Hellos and Shana Faust. Eunice & Sabrina run an adorable company called Hello Lucky while Shana is a freelance stylist. Just a glance at the cover and the ladies credentials and you know this book is going to be chocked full of goodness. I was lucky enough to chat with the ladies about crafts, weddings and more. Even if you already hitched you will take away lot’s of ideas from the book that can be used at your next Birthday Party, Baby Shower or to just simply use as home decorations. 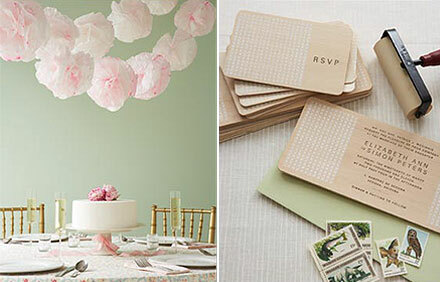 Why do you think handmade touches are important at a wedding? They are the thing that make a wedding personal and unique and get guests really engaged and excited about being celebrating with you. Regardless of what the poo-pooers may say, a wedding really can be the honest-to-goodness best day of your life (when else do you get to party with all your family and friends and have it be all about you?). Handmade touches make an already wonderful day that much more awesome. Also, it’s not just the product but the process of creating the handmade touches that are important to a wedding. Crafting is a great way to re-connect with friends and family, and build anticipation and excitement for the wedding day — the celebration is way more meaningful to your guests when they’ve been personally involved in creating it and have truly shared in the experience with you. I read that you guys all met while working on stationery for Shana’s wedding. What luck to sync up with the style editor from Martha Stewart Weddings! Are there any projects in the book that any of you have used in your own weddings? Absolutely! 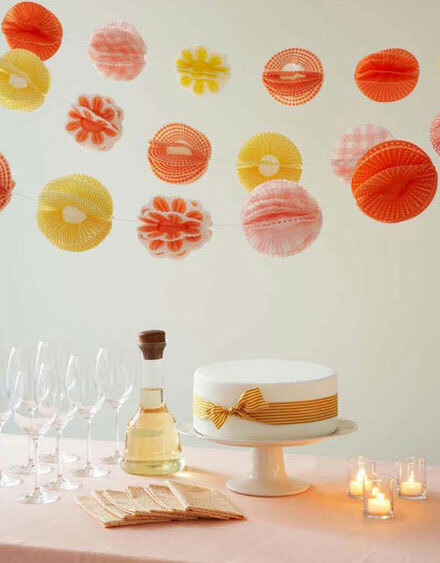 The Dyed Coffee Filter Pom-Poms, the Ribbon Drink Flags, and the Crepe Paper Cracker Favors were all made for Eunice’s wedding. We’ve also made several of the projects for our clients’ weddings so have gotten to see them in action — it is so satisfying! What do you think a reasonable amount of time is to plan a wedding? I know I spent over a year gathering vintage wedding cake toppers, Fenton Glass & 50’s table cloths to give my wedding a “Retro Homespun” feel. It depends on what kind of wedding you want to have: if it’s something small and simple, then you can do it in 2-3 months. If you have a more elaborate vision, then a year is ideal, especially if you are including a lot of one-of-a-kind pieces and handmade details (like you did!). Sourcing the right materials is half the battle in creating a successful hand-crafted project — it can take time and research suppliers, collect samples, etc. (that’s why we’ve included a very thorough list of resources for materials at the back of the book!). Then there’s the crafting, which takes usually takes longer than might think especially if you have to make multiples. For people who don’t have a lot of time, we recommend choosing a couple of handmade details that will either be personally meaningful (e.g. a ring pillow) or give the most bang for your buck in terms of impact (e.g. pom pom strands). We’ve included a timeline of when to get started on various types of craft projects in the book to help break things down so it’s not quite so overwhelming! Is there any aspect of a wedding that you would not try to make handmade? I recently went to a wedding where the bride made her own cake and I thought man a few days before my wedding I was like a chicken with my head cut off I can’t imagine buckling down and making a fancy cake. We would definitely generally avoid making handmade foods because it has to be so last-minute, and because of potential liability issues (guests who allergic to peanuts, etc.!). There are also some things that it just obviously makes more sense to rent than to buy: glassware and silverware, tables, chairs, lighting, a dance floor, etc. (Cautionary tale: Eunice had the idea of collecting vintage silverware for her wedding — she bought a couple of big lots on eBay and ended up with mostly dessert spoons and crab forks, and so gave up!). Flowers are a tricky one because they again have to be last-minute, so it can be stressful. That said, if the arrangements are simple or the flowers are hardy it can be do-able (we have examples in our book – the Teacup Centerpieces and the Terrarium Place Cards & Favors). I love that Handmade Weddings is broken into various themed chapters based on style like Organic Minimal and Happy Graphic Which chapter appeals to you guys the most aesthetically? Any project that you love just a little more than the others? It’s so hard to choose because we love all the styles. But our favorite is probably Retro Homespun. It’s pretty and feels cozy/nostalgic so is a great style to bring to an event as personal as a wedding. It also lends it self to so many great textures and techniques, from yarn to embroidery to fabric to buttons and ribbon. Any ideas on making a wedding more kid friendly? I had several kiddlets invited to my wedding so we had sidewalk chalk, customized wedding themed coloring sheets & even a piñata to keep them all entertained. The Bride and Groom Shakeys seem like they would keep little hands pretty busy. It’s a great idea to have fun, interactive activities at a wedding, but why save them only for kids, we say — have adults get involved, too! Games and activities are great icebreakers for people of all ages. At Eunice’s wedding we had a photo booth with lots of great costumes and props (from a glittered bunny mask to a Mad Hatter hat, to mustaches and word bubbles that people could use to write funny exclamations) — it was a huge hit with all the guests. Have favors at each place setting that encourage creativity and interaction – mad libs about the wedding, song request cards (including songs they don’t want to hear! ), fortunes, jokes, paint-by-numbers style coloring sheets, parlor games, bingo (guests can play based on when certain words or phrases are uttered during the speech – some funny/unpredictable ones can be planted by people who are giving toasts), etc. Fun novelties (e.g., stick-on mustaches) or gag gifts are great favors, too — check out Archie McPhee for ideas. Besides of course your lovely book Handmade Weddings – where are some other places brides to be can look for wedding inspiration? Any fave blogs, mags or books? 100 Layer Cake, Design Work Life, Grey Likes Weddings, Snippet & Ink, Head vs. Heart, Lovely Package, Anthropologie, Kate Spade, J. Crew, and local retail Bay Area & NYC stores Mokuba, Tinsel Trading, Tail of the Yak, Bell’ochio, Lotus Bleu, and Castle in the Air; the Alameda Flea Market. The Domino Book of Decorating, Tim Walker Pictures, children’s books by Paul Rand. Budget is of course a huge aspect of any wedding. Do you think a wedding full of handmade touches saves money, works out about the same or adds a few very worthwhile pennies to the bottom dollar? It really depends on what types of projects you choose, but a wedding full of handmade touches is often going to be more expensive, not less. Beautiful DIY often comes down to the quality of the materials used, and unfortunately great looking papers and fabrics can be pricey. Traditional vendors have economies of scale so can often make things more cheaply than you could make them yourself, and there is also some trial and error involved in DIY that means it takes take several attempts (as art supply bills pile up!) to achieve the right look. That said, you can pick and choose a few gorgeous, high-impact projects and save real money while adding beautiful details to your wedding day. Is there any project in the book that you thought to yourself “man I wish I had done that at my wedding” or “I can’t wait until I get hitched because I am totes having those”. The Paper Link Chains! They are such a simple, inexpensive graphic and gorgeous way to decorate, and they can go in so many awesome directions stylistically. Eunice just made some super skinny ones for her New Year’s party using aqua and gold papers and an effect where the links fade from one color to the next – it was amazing. What is next on the horizon for you 3 lovely ladies? Handmade Weddings was such a lovely book I’m waiting with baited breath for Handmade Parties or perhaps Handmade Babies. We would love to work on another craft book. We all have babies now, so Handmade Babies is a possibility, or maybe Handmade Baby Parties! We’re also waiting in turn with baited breath for Oprah to call us and offer us a craft show on her new network. Tick tock, Oprah, tick tock! Posted January 20, 2011 & filed under Crafts, Holidays, Interviews, Paper Crafts, Parties. I designed & put together our wedding invitations. Also, Joe's sister put together all our flowers. They were artificial, but look real (forget what they're made of to look like that)…I still have my nearly 3 yr old bouquet displayed in our china cabinet…it's beautiful! We had ZERO budget for my wedding in 2008. We decided, since we got married just after Halloween to have a costume party. That way, everyone could "recycle" their costumes, and we wouldn't have to worry about renting tuxes and buying dresses. I had a limited budget for my wedding too. So we roped in friends to help make lots of stuff. we did our own invite cards, got a friend to help with pew flowers and another did a beautful ring pillow. I am making the boutonnieres for my wedding myself. I bought a flower paper punch and have been punching like mad! I always keep an eye out for interesting patterns and textures that fit my color scheme, from envelope linings to test prints from fellow screenprinters. These flowers will certainly add a pop of color to the boy's lapels, and are sure not to wilt!